3 Bedroom 3 Bath with Theater. Quiet neighborhood great for entertaining. -Onsite parkingOriginally a 5 bedroom home, this property has been converted into a spacious 3 bedroom with an office and an upstairs movie theater room with a 140in projection along with a real movie theater popcorn machine! The Kitchen: The kitchen boasts updated stainless steel appliances, granite countertops and cherry wood cabinets. For those who plan to cook in the home, the kitchen is fully stocked with spices, cookware, and utensils. The Living Room: Enjoy our gas fireplace as it reflects off of the decorative fire glass while watching our 80inch television. Master Bedroom features a king size memory foam bed, reading nook, and spa bathroom with large tub, glass shower, and his and her sinks. My name is Brian and I am a business owner and investor who loves to travel with my wife and our puppy Riley. I joined HomeAway in 2015 when I was looking for a beach home to house myself, my wife, and our two friends during the weekend of my wedding. The experience was such a great one that I was hooked on staying in vacation rentals when I traveled. 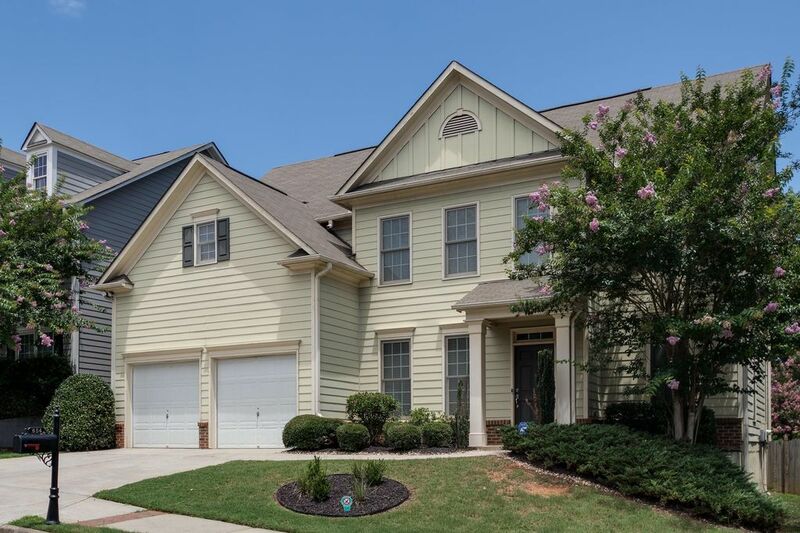 When we purchased our first home in 2016 - a 5 bedroom home in Marietta, GA it only made sense for us to put it on HomeAway. The refrigerator is brand new - all stainless steel. Dishes and utensils provided. Serves 10. Perfect Location and Exactly What we Needed. We needed accommodations for three and space to work through sales meetings and this place worked perfectly. We had plenty of space to set up our computers to connect and view on the big screen TV in the living room to do our work and even more room at the dining table which could seat 6 for meals. There were more than a dozen restaurants nearby and whether we left to visit one or used Uber Eats to have meals delivered it was very convenient. Whole Foods is only a mile from the house so we were completely set. The owner Brian was very responsive and accommodating. The best part is we saved money versus (3) hotel rooms and renting a conference room to have our meetings. No surprises. Owner was very prompt to answer questions. Very clean. Very convenient to Suntrust Stadium. Worked out great!!! Silver clean. Nice quiet neighborhood. Owner very easy to work with, communicated very well. Has a great website to answer your basic questions about everything from WiFi access to how to use some of the technology stuff. Website includes a video on the really cool, high tech front door lock! Atlanta is a beautiful city, but not easy to get around. We found Google maps essential. Found this home to be in a great spot for getting around the North Arlanta area. DJs BBQ in Acworth is a MUST! Thanks Dave! You guys were really awesome guests and took great care of our home. You and your family are ALWAYS welcome back! I was needing a place near KSU for my granddaughter’s high school graduation. Brian’s house was the perfect location. Brian was very kind and very easy to work with. His home is very nice and very comfortable. My granddaughters really enjoyed the theatre room! There is something about this house that makes you seem more like a friend of Brian rather than a random guest. Thank you for your kindness and sharing your home Brian. Thank you very much for the kind words. You and your family were absolutely wonderful guests and you are welcome back anytime! Thank you to your family ! All I can say is Thank You! Thank You! Thank You! Pictures don’t even come close to the splendor of this home. All the comforts of home and then some! From the spacious living area to the comfortable bedroom, the extraordinary kitchen and the many appliances. I especially love all the positive saying on the walls. Movie theater put it over the top in my book. If I could I would rate this property a 10 and the property owners a 20. They were so kind and considerate of our needs. Answer every question without hesitation. I will definitely recommend this property to anyone needed to vacation in Atlanta. I hope it will be available for our next visit to Atlanta.